American beer lovers see breweries as tourist destinations – as in "Let's tour the brewery." It's something to do, and it's beer-related. Fine. Belgians, on the other hand, appear to see breweries in the same way they see museums – as in "Interesting, but where's the café?" As Harry Pearson writes in A Tall Man in a Low Land, "A Belgian hill without a café athwart its crest is a hill that goes unclimbed." 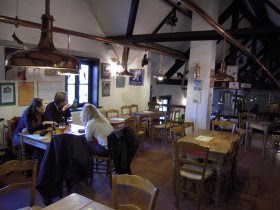 Likewise, a Belgian brewery without a bar attached is a brewery that goes unvisited. And let's be honest: Whose favorite part of a tour is the enlightening lecture on brewing process, or the thrill of a bottling machine in action? The Belgian approach skips all that nonsense and goes straight to the beer at the end. * Saves you valuable drinking time, during which you are free to discuss the rudiments of top-fermentation or the perils of short lagering times, or whatever. From that perspective, one of the better brewery cafés we've found is Ellezelloise, in the Pays des Collines region of northern Hainaut. You kill two birds here because the drinking room offers a full view of the brewing room. Oddly, it's not so well known. Ellezelloise flies its broomstick under the radar of many enthusiasts. Maybe they just don't like the beers. Or maybe they forget about them most of the time. 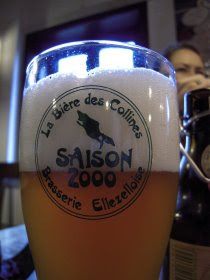 One importer told me that Ellezelloise was definitely not on his list of best Belgian breweries. 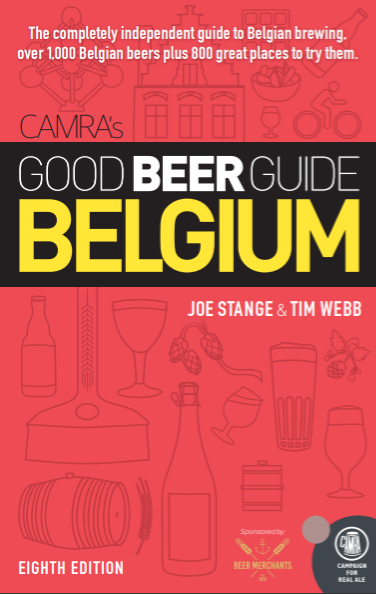 Its beers are absent from 100 Belgian Beers to Try Before You Die by Tim Webb and Joris Pattyn (although most of them get 4 to 5 stars in Tim's last Good Beer Guide to Belgium). They get high scores on Ratebeer and elsewhere, but nobody talks about them much. Well. It would be pretty damn boring if everyone loved all our favorite beers, wouldn't it? From the grainy and quaffable Saisis to the big and roasty Hercule Stout, the Ellezellois beers share a house characteristic: they're generally dry as a desert. The Saison 2000 shows more floral, fruity and clove esters than others of its kind, thankfully made serious by a dose of hop bitterness. And in numerous Belgian cafés, just when you start to fret that there's nothing interesting on offer, the Quintine Blonde often makes a timely appearance near the bottom of the drink card. Altogether it's a rock-solid stable of beers. Things got confusing a couple of years ago when Ellezelloise in Ellezelles and Géants in Irchonwelz merged to becomes Brasseries des Légendes. Nobody really calls them by that name so I stick with the old ones, since they still appear to brew in both locations. Where was I? The café. It's called La Cantine á Quintine, which rhymes if you pronounce it right. All the beers from Ellezelloise and Géants are available here for €3 a pop. There are croques and crêpes and ice cream and other things to munch on. The witch theme gives it a Halloweenish sort of feel (a sign out front advertised a used broom with only 600 flight hours). The wide terrace outside offers a view of the hilly farmland. And perhaps most impressively: It's open every day from 10.00 to 19.00. Still, this is Belgium. Call ahead to make sure. The address is Rue Guinaumont 75, 7890 Ellezelles, telephone +0473 72 01 47. And yes, they can even lead you on an actual brewery tour with advance notice. The cost is €3.20 and includes a drink. *One downside for foreigners and geeks is that good brewery tours are relatively rare in Belgium. There are a few great ones – Cantillon and De Dolle, for example. Others demand high fees or ridiculously large groups – say, 25 or 50 people – to make it worth their while. They are missing opportunities, but that's a topic for another day. I've heard good reviews of the Hercule stout so I picked up a bottle to taste for myself. Upon flipping the top I was instantly disheartened by the tequila-like aroma that jumped out of the bottle. The one sip I could manage was stomach churning sour milk and the rest went down the drain. Given the reviews I know that one bottle was a rancid out lier but I am reluctant try their beer again. I'm not much a fan of pouring $6 out in the sink. I'm a big fan, but agree the Hercule can be erratic. When it's good, it's one of my all time favourites, but I've had a couple that have exploded out of the bottle. To the anonymous BJCP person: All insight is welcome... if you actually have any to share. Otherwise those nonsense posts will be deleted. Oh my god! I always loved the range of beers from this brewery, but never even knew there was a beer tour! So much wasted opportunity.